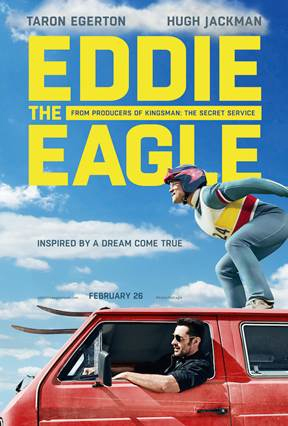 Eddie the Eagle brings to life the inspiring story of Michael “Eddie” Edwards, a British ski jumper who secured a wild card spot at the 1988 Calgary Winter Olympics. 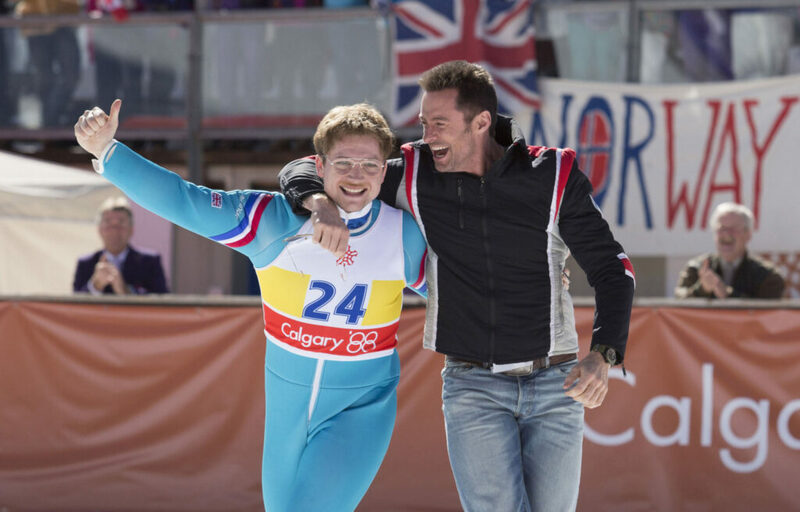 Starring Hugh Jackman and Taron Egerton, Eddie the Eagle soars into the hearts of audiences everywhere February 26th, 2016. 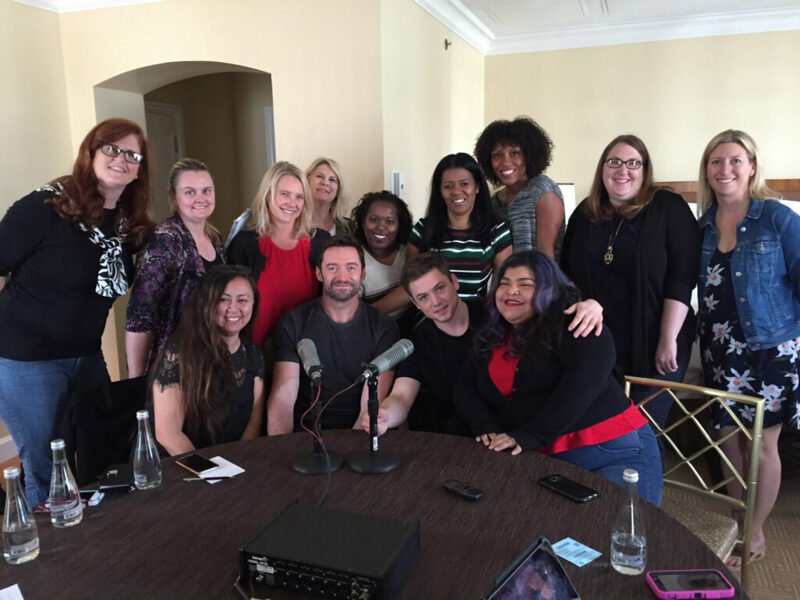 We recently sat with Hugh Jackman and Taron Egerton as they shared their love for their latest film, Eddie the Eagle. In the interview we learned more about why Taron and Jackman couldn't say no to this courageous story of a real-life underdog. Q: What drew you guys to this film? It is such a powerful film. Hugh Jackman: I always loved the story. I was 19 I think when Eddie jumped, and in Australia we were captured by this guy. He became a folk hero in Australia. I think this same reason I loved him there is why I love this movie. It taps into everybody's desire to find the thing they love, to overcome whatever obstacles they are going to overcome. As a parent now, I watch that movie and I am so thrilled my kids are seeing a movie that finally says you don't actually have to win to be a winner. You have to give with your heart, you have to give it all you got, and you've got to love it. That's it. It's okay. That's enough. You don't actually have to be LeBron James, you can be the school teacher down the road and be a winner. Taron Egerton: For me, it was hard to find a reason not to do this movie. It presented a challenge in terms of the acting and I was a huge fan of Dexter [Fletcher], our director. His movies are brilliant. Matthew Vaughn [producer] who I did Kingsman with and of course Hugh, to work with someone who I admire so much was a great opportunity. Q: What was one the hardest aspect of shooting a film like this? Hugh Jackman: One of the hardest things about making a movie like this is there is no stunt man in the world who can ski jump, it's a really weird rare skill, and there is not one ski jumper who will crash, because people die all of the time in this sport. It was really hard to pull off because of all the crashes. Q: Taron, your character obviously is real, but Hugh yours is fictional. What was the hardest thing that both of you had to do to connect to your characters? Taron Egerton: It always felt very easy stepping into his shoes. In the script he was so likeable on the page that it was someone who I just really wanted to connect with him and bring him to life. It was inspiring reading the script. Hugh Jackman: I know we are talking about him, because I was talking with my wife and I can't think of any other actor alive who could go from Kingsman to Eddie and pull both off so effortlessly and unsaid, it was effortless. It was amazing to watch. Q: Did you have a point where everything just clicked? 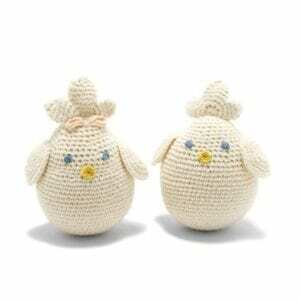 Taron Egerton: There were a couple of them. There was a point in London on a train where I was on the underground system in London opposite you. There are windows and because it is a tunnel wall behind it, it is totally pitch black, so you can spend a lot of time checking your hair out and being narcissistic, but I was trying to figure out what I was going to do, because there was a lot of talk about me having prosthetics and I really, really, really didn't want to do it. I was trying to find a way of doing it without making a mess. And then we did a big costume test on the server. I had to walk around with skis when we first got to Germany and there was something about that marching around, and then of course it comes when you do the first stuff with Hugh because it is really all in the friendship and dynamic between us. Q: Did you have the opportunity to meet Eddie? Hugh Jackman: Yes, he came on set. We were at the ski jumps and he was so bored by filming after two hours. Q: What does Eddie do now? Taron Egerton: I think he still does a bit of jumping. He loves it, it is his life. I think he does a lot of kind of motivation inspirational talks as well, because of his amazing story. I think he is quite an amazing guy to hear speak. He is not gregarious or loud, but he is a very inspiring, engaging chap to talk to. Q: Was acting your best childhood dream? When they talk about in the movie like, “When you were a kid, didn't you ever have a dream?”, because you guys have made it now. You are in the Olympics of acting now. Taron Egerton: I started wanting to act in my mid-teens actually. I was quite late. I used to draw a lot when I was a kid, so I wanted to do animation. My dream was to work for Pixar. I was not good enough to do anything anywhere near that specialist and brilliant. Then when I was about 15, I had friends who were in youth theater. I was always a bit of a class clown, the kid with an answer for everything. I went along and fell in love with it, got the bug, and auditioned for drama school a couple of years later. Hugh Jackman: I often pinch myself because I got my first job when I was 26. I went to drama school when I was 22, so it was late, but I had always done acting as a hobby. I'm like the weekend golfer when someone taps him on the shoulder at age 26 and says “Do you want to come on the tour?” and I'm like “What?” I still feel like that. I pinch myself all of the time. I will always try to be careful not to use the word career, because I don't think it is a right for any actor. It is a great privilege to work on any job and at any point so many brilliant actors are out of work, it seems weirdly random and unfair and I'm very, very grateful. I don't take it for granted. I know Taron doesn't either. Q: As a working parent, what do you do to guide your children in pursuing their dreams besides watching this movie obviously, and for you, what did your parents do for you? Taron Egerton: My mother did, and my father, they have always, not to get soppy, my parents have always done everything for me. Everything that is good in me is my mother. 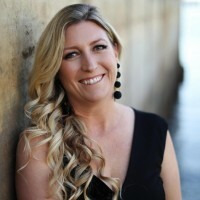 She is an incredible, incredible, incredible force of nature, brilliant support. She did everything. I can't even think of one thing because it's everything. Hugh Jackman: I believe in letting kids be kids for as long as possible. It was different in my age. I was talking with someone yesterday. I went to a university. I don't ever remember even talking to my dad about what university or what I would study. I made that decision back then. I think we are more into our kids lives, but I do constantly talk to them about giving everything their best and doing the thing you love, because I have managed to find my way into a job that doesn't feel like a job and if my kids can be lucky enough to do that, then that is the goal. That is the Holy Grail. Just follow their passions and then work hard at it. Because even the thing you love to do is going to be a pain at some point. 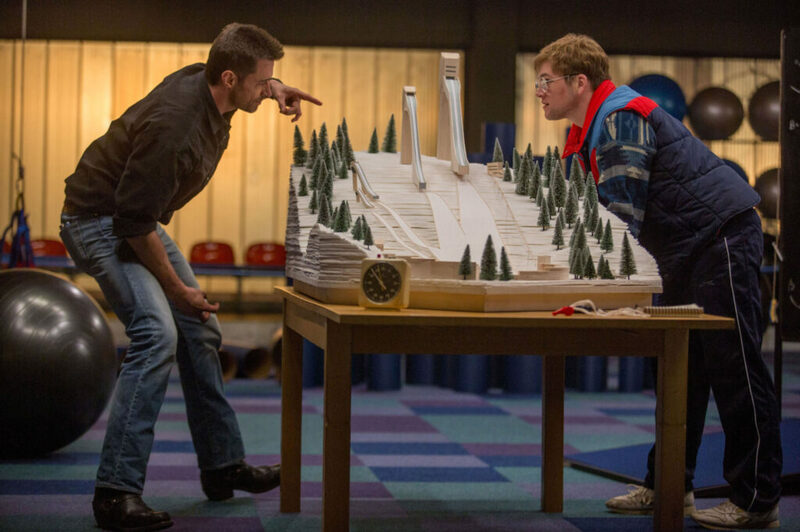 Eddie the Eagle opens in theaters February 26th, 2016. Portions of this material have been provided by 20th Century Fox.